Apr 10, 2019	Written by Frank Merrick. Only one more week of competitions to go, then, boom! Championship! I don’t know how your season has felt, but for me, it’s flown by! We know that not everyone makes it to Championship, but we hope that even if you didn’t make it you still had a fantastic FIRST Robotics Competition Season and can’t wait to join us next year. And, hey, plenty of off-season events will be going on if want to get in more FRC action before 2020! Here’s a little info for folks that are attending Championship. As we’ve communicated in our Championship blasts, Chairman’s Award interviews will be both Thursdays and Fridays this year. Thursday, they will be from 11 AM to 4 PM and Fridays they will be from 9 AM to 11 AM at both Championship locations. Interview sign-ups will be on Wednesdays from 4 PM to 7:30 PM in the Hall of Fame Booth at both locations. Only teams who have won Chairman’s Award at a prior event this season are eligible to sign up, but if you are eligible, please put this on your ‘kinda pretty important’ list of things to take care of. Want to make your trip to Championship a little easier? Check out these packing tips for load-in and load out. You want Quiet Rooms at Championship? You got Quiet Rooms as Championship. In Houston, the Quiet Room will be in room 332F, and in Detroit, the Quiet Room will be in room 411C. Quiet Rooms will be open whenever the pits are open. If you feel like you need a quiet place to relax for a few minutes and gather yourself before going back to the excitement, please stop by. And Teams, we are looking for donations for Quiet Room supplies! Please sign up using this form. 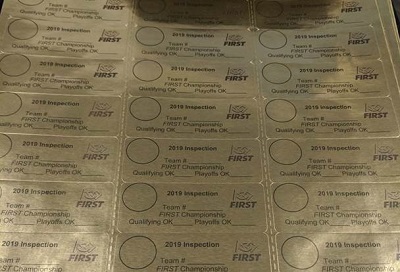 Oooh, and we got in some shiny Inspection stickers for Championship. Check them out! Robots at Championship don't just pass inspection, they get all A's! I'll be seeing many of you soon!